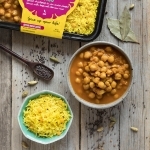 Classic chickpea comfort food, mild and delicious any time of the day! 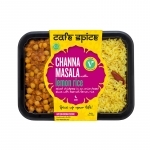 Channa Masala, the beloved North Indian comfort food that’s enjoyed day or night, breakfast, lunch or dinner – or as a between meals snack. Chickpeas are soaked overnight, then slowly cooked in a mild, fragrantly spiced onion gravy and served with the ever popular Basmati Lemon Rice. While comforting and delicious, this dish also provides a good source of fiber and is high in protein.